What Day Of The Week Was October 18, 1977? 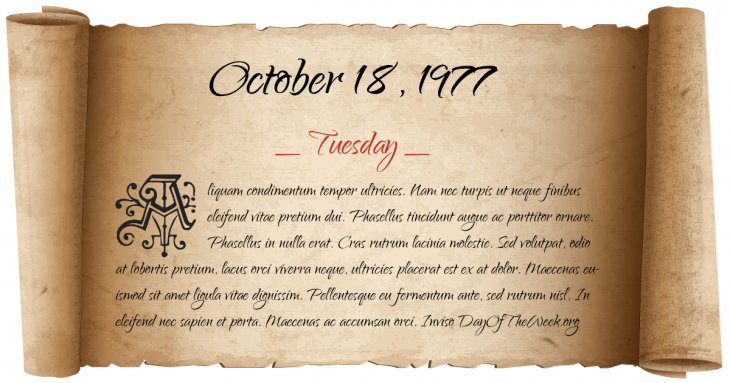 October 18, 1977 was the 291st day of the year 1977 in the Gregorian calendar. There were 74 days remaining until the end of the year. The day of the week was Tuesday. A person born on this day will be 41 years old today. If that same person saved a Dime every day starting at age 7, then by now that person has accumulated $1,260.30 today. German Autumn: a set of events revolving around the kidnapping of Hanns-Martin Schleyer and the hijacking of a Lufthansa flight by the Red Army Faction (RAF) comes to an end when Schleyer is murdered and various RAF members allegedly commit suicide. Who were born on October 18, 1977?